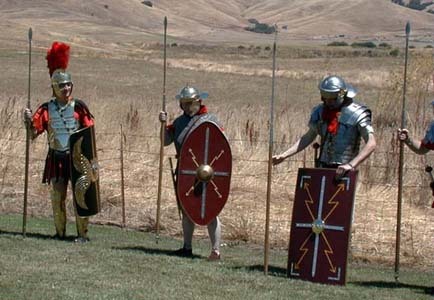 - Gaius Germanicus Magnus (Steve Oster), Patti Ballard, and Antony Lucius (Anthony Garbisch) stand with pilum and shield ready. Click on image to return to thumbnails page. Gaius Germanicus Magnus (Steve Oster), Patti Ballard, and Antony Lucius (Anthony Garbisch) stand with pilum and shield ready.